If you wanted new iPads, new MacBooks and new Apple software today, then Apple gave you what you wanted. As expected, Tim Cook and company refreshed their product line, threw in a couple lines dismissing the competition, and moved on. In other words: If there’s any sense internally at Apple that the company needs to radically overhaul what it’s doing, you weren’t getting any hint of that today. For instance: Apple continues to price its iPads at a premium compared to competitive products from Amazon and Google. And, if anything, Apple went out of its way to insist that its stuff deserves to be more expensive by kicking off its event with a video extolling its superior design principles. Next up: A referendum from customers, who will vote with their pocketbooks in the next couple months. 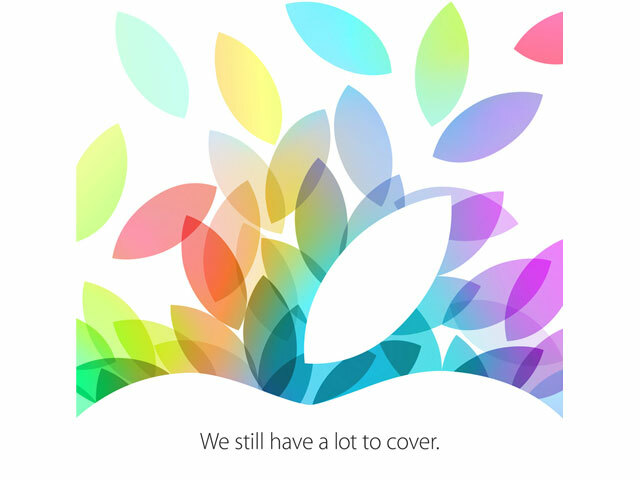 Apple is going to introduce new iPads today. They will have new innards, and at least one should have a new screen. If you want a very good handle on what else we’re about to see at the Yerba Buena Center this morning, check out John Paczkowski’s comprehensive preview. And if you want to see Tim Cook and company show that stuff off, come back here shortly before before 10 am PT, where I’ll be covering the event live, along with my colleagues. Note, by the way, the absence of any media-related chatter leading up to today’s event. Even today’s ritual Apple TV speculation — this time, courtesy of an analyst at Advanced Research Japan — is talking about a unicorn gadget that’s not supposed to surface until a year from now. If you want to augment our present-tense coverage with a video stream, turn on an Apple device and head here. 9:49 am: Swing low on your weep ships, everybody! Typing this at you live from the innards of the Yerba Buena Center in San Francisco. We’re at least 10 minutes away from showtime, so will be vamping a bit till then. 9:50 am: Here’s an experiment: If you want to chime in, try replying to me on Twitter at @pkafka, and I’ll see if I can include your comment in my stream of semiconsciousness. That is a great question. Thanks for asking. A little embarrassing, but I can’t tell. This song, for instance, sounds a bit like The Cure sped up a smidge. But I’m pretty sure it’s not The Cure. @JohnRMcLaughlin suggests that I Shazam the music, which would be a great idea, but Shazam won’t work with this much ambient noise. Still, Lauren Goode will try Shazaming, just to see. 10:00 am: A question I can answer for you: These awesome photos are courtesy of Adam Tow, who is not only our tech guru, but really good with a camera, too. Animation + words, meant to convey that Apple takes design very, very seriously. They don’t just slap stuff up on a shelf. Like some other people. Presumably, this will be on YouTube shortly. 10:02 am: Tim Cook onstage. Loud applause. Ah. That video comes from WWDC. Updates on product stuff. How’s the iPhone 5c doing? How’s the 5s doing? Repeats nine-million launch-weekend sales figure. Applause. Here’s another video, showing what it was like to be at an Apple store on iPhone launch weekend. People were totally psyched to buy iPhones. Pretty sure we’ve seen other versions of this video at prior Apple events. 10:07 am: Meanwhile, a Twitter question from @otchtrainer: How will the old iPads be disposed? Any program for recycling e-waste, etc., so the heavy metals aren’t put in landfills? Doubt we’re getting an answer, but will keep an ear open. 10:07 am: Cook is back. Talking up iOS 7. Repeating 200 million device-upgrade number from launch weekend. Now, 64 percent of iOS devices are running iOS 7. 10:08 am: iTunes Radio talk. Includes endorsement from Justin Timberlake. App talk: one billion apps, 60 billion downloads. Devs have earned $13 billion. Mac talk: Macs are awesome. But we know what we’re doing. Here are some new cool Mac products. 10:11 am: Here’s new Apple superstar Craig Federighi to talk about OS stuff. Federighi says power efficiency is getting better on Macs. And if you install Mavericks, it will get better. iBooks now running on your PC, too. Demo time. Gut is that any description I try to write here won’t do a good job of what Federighi is doing onstage. There is a joke about Federighi’s untucked shirt. Sites Federighi has shown off so far include MLB.com and Gilt Groupe. Ah, and The Wall Street Journal, with a story about Apple’s upcoming starship campus. Calendar app is now “location aware” and integrated with Maps, so when you add in new meetings, it will tell you how long it will take to get from the old meeting. Groovy. Federighi notes that they’ve been updating Mac software every year. “Today, we announce a new era for the Mac,” because Mavericks update is free. Loud applause. Single-step update from any old Mac OS, at least going back to Snow Leopard. Will apply to Macs dating back to 2007. 10:24 am: Here’s Phil Schiller, on to talk MacBooks. Today we’re talking about MacBook Pro. Updates for 13-inch. Now lighter: 3.46 pounds. Thinner: .71 inches. Fourth-gen Intel Haswell chip, with Iris Graphics. 15-inch. Intel Crystalwell chip. Iris Pro Graphics. They are environmentally friendly, Schiller says. Next up: Mac Pro. Here’s the cool/scary cylinder design they showed off in the spring. Now we’re going inside the MacPro, to talk specs. Animation reinforces the Death Star vibe. Rather than retyping the specs, I will link to them when they’re available. There are many acronyms. Also: “Up to seven teraflops” of computing power. No hard drive. All flash-based. Will be awesome for 4K video. Here’s what my colleague Lauren Goode has to say about Mavericks, by the way. Here are people who have used the new Death Star Pro. They include: Director Dean Devlin; Lucas Gilman, who shoots for Sports Illustrated and National Geographic; and music producer Stuart Price. They all love it, Schiller reports. Mac Pro is assembled in the USA. Here’s a video about creating the Deathstar Pro. Lots of robots involved in building these things. People, too. Slick video. Assume we’ll have it up on YouTube shortly. 10:41 am: Here’s Eddy Cue, who runs Apple’s media business and more. He’s here to talk apps. New versions of iPhoto, GarageBand, etc. He’ll touch on a couple different feature sets. His untucked shirt has white cuffs. That’s different from the rest of the Apple execs onstage so far. iMovie is now simpler, which would be great, since iMovie is really complicated. GarageBand gets a makeover, too. Relevant for people who use GarageBand. Ah. Xander Soren. That makes more sense. Xander off. Eddy Cue back. New iLife software free with purchase of any new Mac or iOS device. Apple has been using new Keynote software to power today’s presentation. 10:51 am: Here’s what John Paczkowski has to say about the new Mac Pros. 10:52 am: New iWork demo, conducted by someone whose name I didn’t catch. Meanwhile, here’s Mike Isaac on the new MacBook Pros. All right, demo is over. All of the new apps are free with purchase of new hardware. Applause. 10:57 am: Cue off, Cook back on. Cook pausing. Now he’s back. “We are turning the industry on its ear” with free software. Remember when iPad was described as a “magical” device? Tim Cook does. He also remembers the haters, and the netbook fans. “We really believed in our vision.” Now approaching 180 million units sold. Now, some of the haters are making tablets, too. But no one uses them: Cook claims iPad has 81 percent of “usage share.” Doesn’t explain where data comes from. Our customers are super-smart creative geniuses. Here’s a video about them. Same piano-heavy soundtrack that scores those really good iPhone ads. You can take your iPad hang-gliding and on a fire truck. And when you dance! And rock out. And get in the huddle. And camp in a tent on the side of a mountain. 11:05 am: Phil Schiller is back to tell us more. 11:06 am: Another video. This one comes with space-flight sounds. “The bezel around it is smaller than ever. Dramatically so.” 43 percent thinner bezel. “Amazingly thin.” “Dramatically thinner.” Whole device is 20 percent thinner than last model. Thin thin thin thin thin. Also: Lighter. iPad Air is one pound, down from 1.4 pounds. “When you hold it, it will be a dramatically different experience” than old iPad. YOUR OLD IPADS ARE TOO FAT. Inside: New A7 chip. Same chip that’s in iPhone 5s. Schiller cites Gizmodo, the same site Apple was once very angry with. CPU is better. GPU is better. Multiple antennas. More LTE coverage with more carriers. Front-facing FaceTime HD camera. Dual microphones. Apple hasn’t given up on Siri yet. Silver/white, space gray/black. Starts at $499. Old iPad 2 still available at $399. iPad Air starts shipping Nov. 1, including China. Here’s another video. First Jony Ive appearance. Ad network Chitika, by the way, wants credit for that 81 percent usage figure. Here’s an argument in favor of taking Chitika’s data with a dose or two of salt. That said, I have talked to some media companies that do report that most of their tablet use comes from iPads. So there’s at least some truth there. 11:15 am: Schiller back. Now talking iPad mini. As promised/predicted, iPad mini gets Retina display. Also A7 chip. “Toldja!” says John Paczkowski. Let’s recap. In the last few months, we’ve introduced awesome new phones. And an awesome new iOS. And now, awesome new laptops, and that Death Star. And awesome new iPads. Here’s a cool new ad for the iPad Air. New iPad is thinner than a pencil. Thanks to all the great Apple employees. Please come touch our machines. Thanks for reading, readers! I’ll head off to get hands-on shortly.